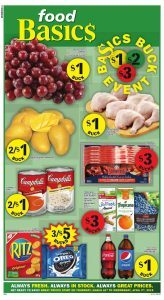 Food Basics Flyer Buck Event 31 Mar 2019 BUCK EVENT HERE! Food Basics Flyer Buck Event 31 Mar 2019 contains always fresh, always in stock and always great priced products. In my opinion, you must buy healthy foods from Food Basics. Because of the best prices available only in Food Basics. You can prepare delicious salad plates or healthy juices with these healthy foods. All vegetables and fruit waiting for you in fresh rayon. Buck event is just started. Enjoy your shopping every day of the week in Food Basics!